Update: Ichiro Akuto's new distillery has got its official licence. The Hanyu distillery sat in a town of the same name in a plain of rice fields near the Tone river. 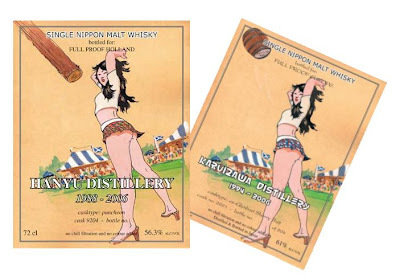 Unfortunately, the Toa company which ran Hanyu went bankrupt and stopped distilling in 2000. The stills were dismantled in 2004 after a change of ownership. It seemed like the end of a long history of family brewing and distilling stretching back to the 17th century. The business had been founded by the Akuto family, sake-makers from the town of Chichibu, and an Akuto - Isouji Akuto - was still in charge when the Hanyu plant was built during the Second World War. In about 1980 they began Scotch style whisky making but were unable to survive the venture's birth pangs in a contracting and increasingly competitive market. And there the story of Hanyu would rest, another footnote in the corporatisation of Japan, if it were not for Isouji's grandson Ichiro Akuto. He worked as a brand manager for the big conglomerate Suntory as a young man and then joined his family's company as sales manager. He was president when the firm hit the rocks. However, with the help of a sake making company called Sasanokawa Shuzou, he was able to salvage something from the wreck of his family's business: a large part of the stocks of malt whisky held at Hanyu, which were no longer wanted by the new owners of the site. Ichiro has started a new company - Venture Whisky Ltd. - to market this whisky. He wants to set up a new distillery and is using all his marketing expertise to get people involved in the story of this phoenix-like rebirth and to establish "Ichiro's Malt" as a strong brand. He is greatly helped in this endeavour by the fact that some of the old Hanyu whisky he is selling is of excellent quality. The branding is worthy of an old Suntory marketing hand, with a distinctive playing card theme being employed. Ichiro Akuto has begun to assemble the distilling equipment he will need to start production again and has picked a new site. He says the new distillery will operate on a small scale, emphasising traditional crafts and skills. 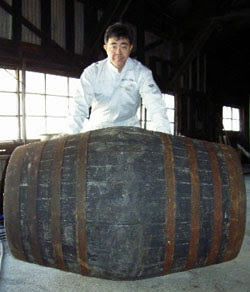 He has employed Mitsuo Saito, one of Japan's most experienced coopers, to make Japanese oak and American oak casks for him. View the location of the old Hanyu on a map of Japan's single malt distilleries here (I have not yet confirmed this location with Akuto san, but I am pretty sure). If you download Google Earth and click on the "KML" button above this map you can see the topography in 3D! Number One Drinks Company - import Ichiro's malt into the UK. Their website was the source of some of the information in this entry and I stole my main illustration from them too.